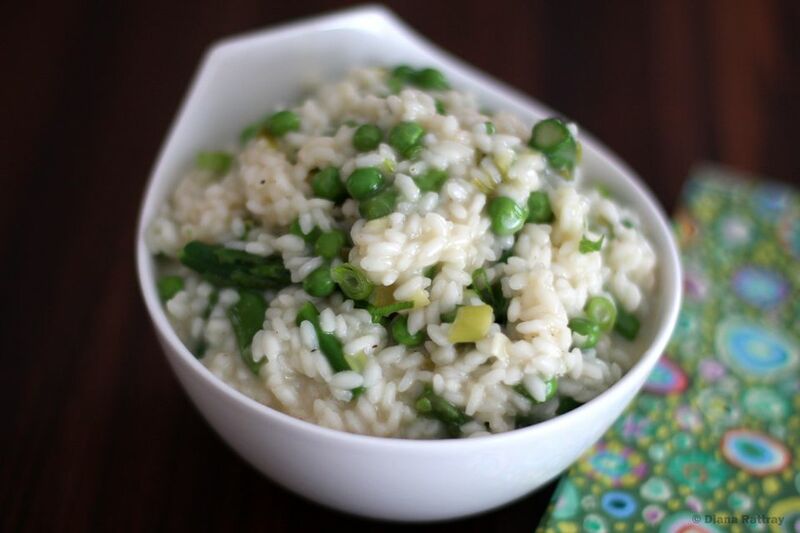 Celebrate spring with this wonderful creamy risotto! Asparagus, peas, and green onions are featured in this risotto, along with a little dry white wine and Parmesan cheese. Feel free to use more or less Parmesan cheese to suit your taste. Cook the asparagus in a small amount of water or roast it. See the tips and variations below the recipe for roasting directions. Bring a medium saucepan with about 2 inches of water to a boil. Add 1 teaspoon of salt and the asparagus. Cook for about 2 minutes, or until just barely tender. Drain in a colander and rinse with cold water. Bring the chicken broth to a simmer on the stovetop and keep warm. Reserve 1/4 cup of the broth for the end of cooking time. Put the olive oil in a large saucepan or saute pan over medium heat. When the oil is hot, add the green onions. Cook, stirring, for 2 minutes. Add the rice and cook, stirring, until all grains are coated with oil and translucent, about 2 minutes. Add the wine and cook, stirring, until most has been absorbed by the rice. Add chicken broth, about 1/4 to 1/2-cup at a time. Cook, stirring constantly, after each broth addition until the rice has absorbed most of the broth. Don't let the rice dry out at any point. Continue adding and broth and stirring until the rice has become tender but still a little firm in the center. This will take about 18 to 20 minutes. Add the asparagus and peas to the rice and continue cooking, stirring, until heated. Add more broth as needed. The rice will be tender, but slightly firm. Add the reserved 1/4 cup of broth and the butter, stirring thoroughly until well blended. Blend in the Parmesan cheese and add Kosher salt and freshly ground black pepper, to taste. Roasted Asparagus: Cut the asparagus into 1-inch lengths. Toss it with 2 tablespoons of olive oil and arrange it in a single layer on a rimmed baking sheet. Bake in a preheated 425 F (220 C/Gas 7) oven for about 12 to 15 minutes, or until just tender. Use brown Arborio rice and plan to add about 10 to 15 minutes to the total cooking time.